It gives me great pride to call myself a potter. To exhibit and sell my work is further validation. I am part of crafts tradition that is ancient, worldwide, and enduring. When I hold a handmade object, my hand touches the hand of its creator. Likewise, part of me goes with each object that I make, give away, sell or even discard onto my chard pile. With clay under my fingernails, life is rich. 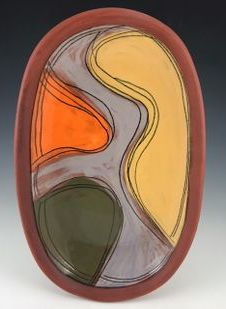 After a career in public education, Janet Stewart retired to Alpine, Texas, with her husband George Pitlik in 2006 to pursue an “encore career” in ceramics. She is an advanced student in ceramics at Sul Ross State University and has attended extended summer workshops, including Texas Tech University at Junction, Penland School of Crafts in North Carolina, and La Meridiana School of Ceramics in Italy (fall 2012). She is a member of the Texas Clay Arts Association and regularly attends statewide and national ceramic conferences, workshops, and events. 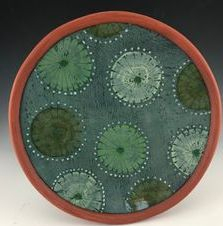 In addition to making ceramics, Janet is an enthusiastic collector of vintage Fiesta Ware, Rookwood, and other early 20th Century pottery and art nouveau tiles. She collects pottery and tiles during her travels to countries known for exceptional ceramics, such as China, Turkey and Portugal. Her growing collection of contemporary ceramics includes pieces to use, enjoy and inspire. Former gallery director, Janet now serves on the steering and display committees at Gallery on the Square in Alpine, where she also exhibits and sells her work. She may be contacted at stewartpottery@yahoo.com. I have no explanation for why I am so drawn to clay. Maybe it was my childhood summers in East Texas digging for China in the red earth of my grandparent’s backyard, or the endless mud pies that followed. Perhaps it was the subliminal attraction to my grandmother’s colorful Fiesta Ware dishes, which I was fortunate to inherit in my 20’s. Handmade ceramics had a resurgence in the 1970’s, and I admired the work of artisans at craft fairs. I knew that to create such work required an investment in time and energy that I did not have, so I appreciated their craftsmanship but never considered that I could become a potter some day. They say that luck favors the prepared individual. That’s true. Who knew that our retirement destination, Alpine, Texas, would offer me a full-blown university ceramics education? Such a gift! I have enjoyed every day in the ceramics studio at Sul Ross State University. Simply becoming a student again, learning new skills, mastering new techniques, exercising dormant creativity, and realizing that I will never learn enough has fed my mind and spirit. To experience the pure joy of learning gives me immense wonder and gratitude for my good fortune. And then there is the clay. What a lovely material it is. Earthy, rich, creamy, elastic… As I sit at the potter’s wheel, wet my hands, close my eyes, and center the clay I can sense that my brain is generating serotonin. It is a pleasurable sensation. The clay gives unambiguous feedback, and that moment of finding perfect center is the first victory. From there, it is a matter of doing the dance between an idea or image of a form, and the movement and control of my hands on the clay; the speed of the wheel, the pressure given or released – so much happening at one time – to change the lump into a form. Refinement extends the dance and adds interest and pleasure to the process. So much problem solving and so many decisions are made simultaneously; it’s a mind-expanding endeavor! The product of this process is unknown until the kiln is finally opened; emotions run the gamut from joy to agony, sometimes within the span of one firing. While my mind’s eye may have envisioned a certain outcome, the glaze and fire can produce a different, unexpected effect, sometimes for the better or worse. That is the magic of high-fire ceramics. “If you want a golden rule that will fit everybody, this is it: Have nothing in your houses that you do not know to be useful, or believe to be beautiful.” This quotation by William Morris in 1880 guides my efforts to produce ceramic objects that are aesthetically pleasing for daily living. The functional pieces are food safe and are made of stoneware clay that is glazed and fired in a gas kiln. Most are thrown on the potter’s wheel, and some of the surfaces are embellished with stamps and relief carving. Decorative tiles are made from terracotta clay. 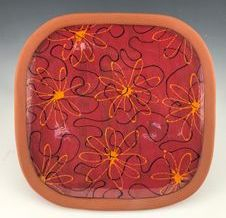 They are designed, carved, painted with colored terra sigillata (fine clay particles), and fired in an electric kiln.